Smart Lease have fantastic cheap Vauxhall Astra personal leasing deals and business contract hire Special offers. For those who aspire to own an Astra VXR or SRi but lack the money to realise their ambition, Vauxhall may have a cunning compromise to satisfy those desires, at least partially. It comes in the form of the Astra Exclusiv range that we look at here. 'Hot Hatch' it is never going to be but it could be warm enough to entertain sufficiently to satisfy those with mild sporting tendencies. We have some of the cheapest Vauxhall Astra Exclusiv Hatch and Estate leasing prices through out the UK. Special Offer Prices : Astra prices are based on contract hire or private leasing over 48 / 36 Months. 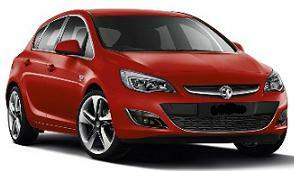 Vauxhall Astra 5 Door Contract Hire and Personal Contract Hire Rates based on 10K mpa (other mileages available). • ecoFLEX technology for impressively quiet, clean and economical engines The choice of engines available for the Vauxhall Astra is staggering. No matter what your driving style, you’ll definitely find something to suit everyones specific needs.